It feels a bit wrong, me being the one to write about Dexy’s. I have friends who are much much bigger fans, I have already written about the other Dexy’s track on this list – Come On Eileen. 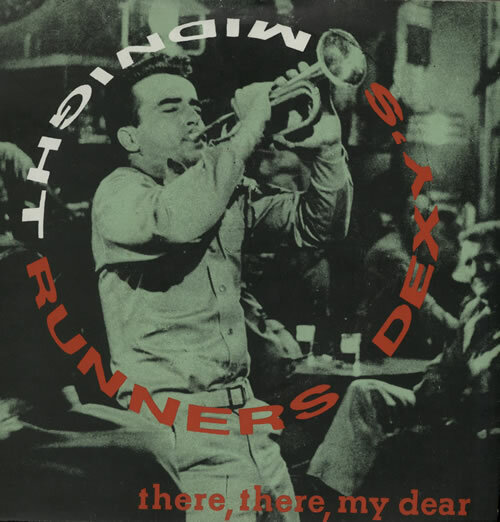 And for a very long time, until I picked up a cheap reissue CD of Searching For The Young Soul Rebels in 2002, Come On Eileen was one of the three things I knew about Dexy’s. The other two being Jocky Wilson Said and the Theme From Brush Strokes. Which for any band would be enough for at least a page in any half decent history of pop. You see Robin, I’m just searching for the young soul rebels, and I cant find them anywhere. Where have you hidden them? I also knew, obliquely, about There, There, My Dear, from one of Danny Baker’s shows in the mid-nineties where, in a typical off the cuff riff, he discussed Kevin Rowland’s spoken word piece in the middle of the track. There was a suggestion that rather than leave the title of the album a manifesto baiting enigma, he kind of blows it by suggesting that the Robin the song is aimed at has hidden the Young Soul Rebels somewhere. Perhaps under the sideboard, or swept under the rug. So when I saw heard it properly for the first time I recognised this odd moment, though truth be told at the end of the album it makes a hell of a lot more sense. There, There, My Dear caps off Searching For The Young Soul Rebel as a blasting statement of intent. Its not the only track on the album to come in all barrels blazing with the horns up front and centre. Its also not the only track where Rowland’s blustering pyrotechnic delivery threatens to break the song on a number of occasions. I don’t know the Robin this epistolary song is aimed at, but my bet is that the name was picked for the sibilant R which ddddddddddddddddddRowland ddddddddddddddddRolls like he is Mam’zelle at St Claire’s*. Whoever Robin is, he is the early eighties version of a hipster, a music journalist too interested in cool than to open his ears to what Dexy’s were doing. This seems a little unfair, horn sections may well have not been in favour when Dexy’s emerged, but I am always wary of bands who write songs, if not whole albums, taking their critics to task. Surely the music is meant to solve that problem on your behalf, and bands who are too obsessed with what the music press often end up either bitter or chasing their own tail. But such is the specific genius and madness of what I know of Kevin Rowland. Attacking pretension whilst being fantastically pretentious, looking for a new music by aping a type of soul which had drifted out. All of which is made palatable by this overwhelming force of personality and energetic drive that runs through There, There, My Dear. This is a record, and an album, that sounds live, that promises a sort of live experience, and delivers. *Enid Blyton girls Boarding School, slightly less famous than Mallory Towers. What? I had an elder sister. I don’t know for sure, but I always assumed the ‘Robin’ in the first verse, at least, was Ian McCullogh. Mainly because he used to witter on about Frank Sinatra in interviews, as I remember it. The rest of the verse fits him like glove, but that was what I took to be the giveaway. But it’s so long ago that I probably don’t even remember that right; maybe it was actually Debbie Harry who used to go on about Frankie… Absolutely amazing song, though. And here’s the annotated There There My Dear. I remember hearing that 'Robin' was Ian Page of Secret Affair, whose single "Time for Action" was getting a lot of attention and a lot of sneers at the time. There's even a Secret Affair/Dexys connection – Seb Shelton joined Dexys from SA – although this may not be relevant.